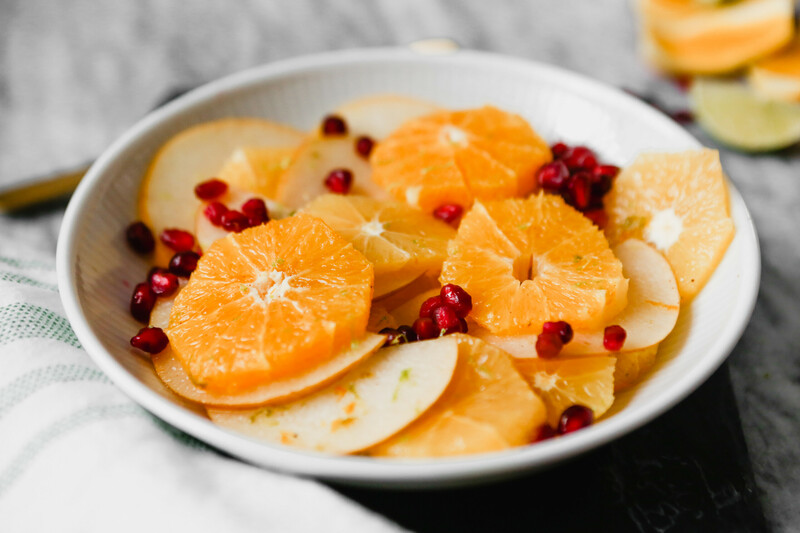 This spiced winter fruit salad with a honey lime dressing is flavorful, easy to make, and absolutely gorgeous. With such a simple ingredient list, this fruit salad can easily be doubled or tripled, making it the perfect fruit salad for a crowd. 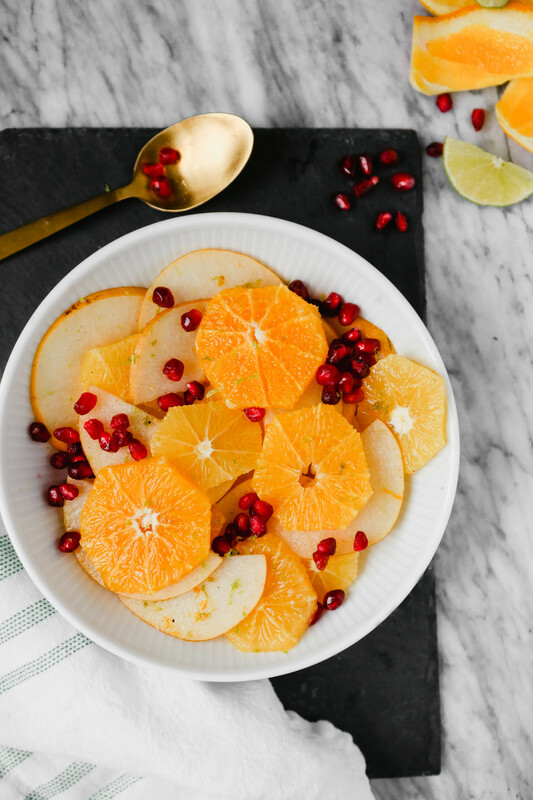 This citrus salad, made with oranges, pears and pomegranate seeds, is a great addition to any brunch menu. But this week I’m featuring it on our Leftover Turkey Menu alongside our Chinese Turkey Lettuce Wraps. 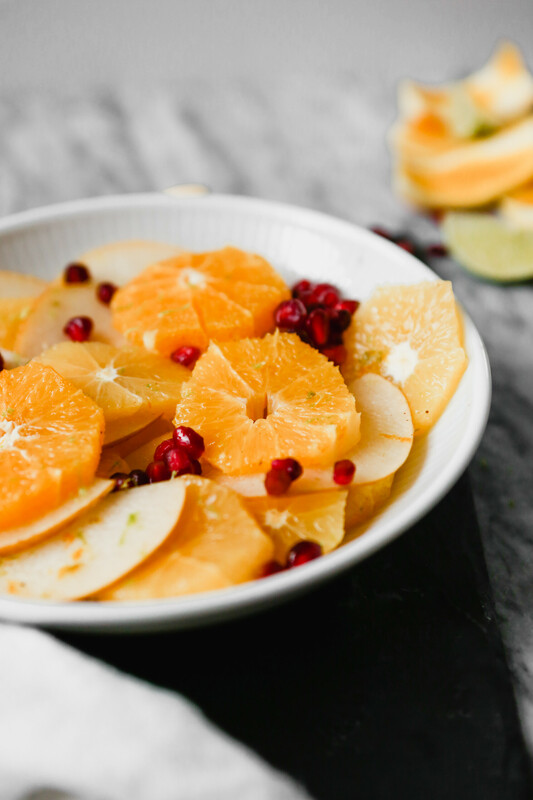 Flavored with fresh lime juice and zest, honey and just a touch of five-spice powder, this seemingly simple fruit salad is more complex than it lets on. What other citrus can I use in this salad? Look for whatever citrus is readily available. During mid- to late-winter keep an eye out for blood oranges and kumquats, both of which would be great additions to this salad. 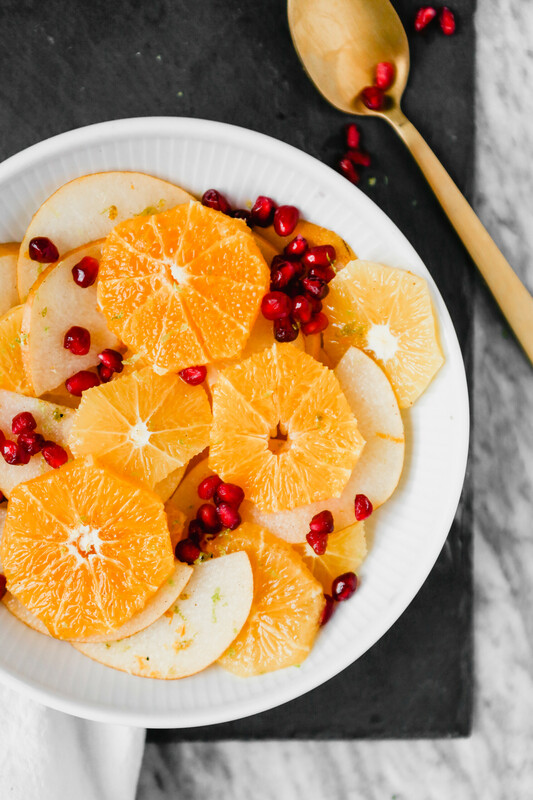 Otherwise, mandarin oranges, ruby grapefruit, clementines and tangerines would all be great options for this spiced fruit salad. How long does fruit salad keep? Fruit salad is best consumed within a few hours of making it. And since this one is fairly simple to throw together, I would recommend not making it too far in advance. However, fruit salad will keep in an airtight container stored in the refrigerator for up to 3 days. What should I serve fruit salad with? Fruit salad is a wonderful addition to many different kind of meals, but it’s particularly right at home on a brunch menu. 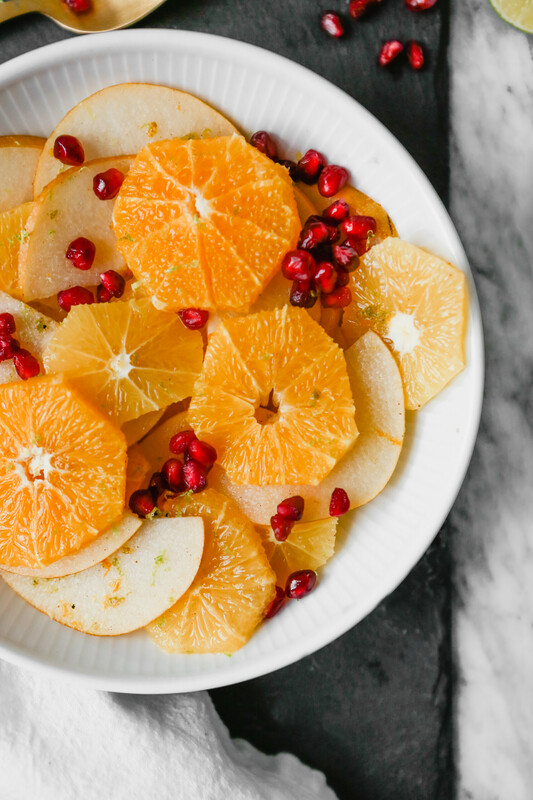 This winter salad, with bright citrus flavors, a touch of warm spice and a pop of color from pomegranate seeds, would be an exceptional addition to any Christmas brunch menu. When it comes to lunch or dinner, serve a fruit salad with a main dish that’s savory and bold in flavor. Often times a green salad is used as the “palate cleanser” or the bright counterpart to a heavier main dish. 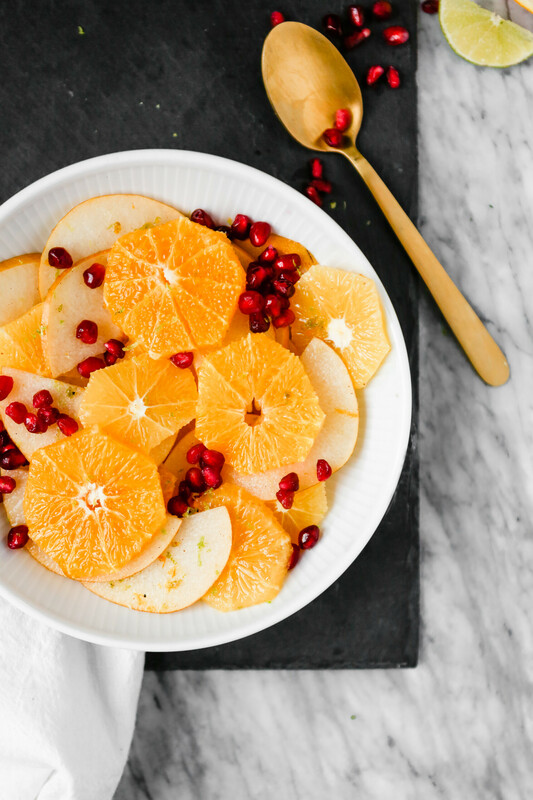 But when you’re looking for something a little sweeter or more juicy, opt for a fruit salad. Looking for a menu idea? Check out my Leftover Turkey Menu Below! 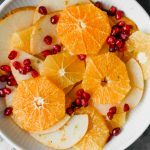 This spiced winter fruit salad with a honey lime dressing is flavorful, easy to make and absolutely gorgeous. Featuring just a touch of five-spice powder, this fruit salad is both refreshing and comforting. In a medium bowl whisk together lime juice, honey, lime zest, orange zest, five spice powder, and salt. 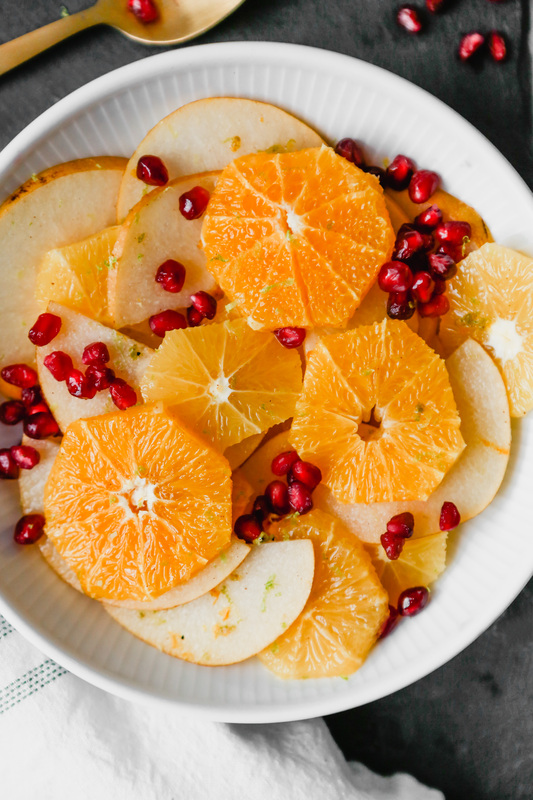 Add oranges, pear, and pomegranate aril and gently toss to combine and serve. Yum! What unique flavors in a fruit salad. This was perfect for a holiday get together.